Visions of frost-covered trees, vast blankets of snow, and glistening frozen lakes form together a scene that’s worthy of being printed on a Holiday postcard. But for those of us who need to commute to work every day, the Winter season often poses an annual slew of potentially-hazardous environmental threats. The bitter and biting chill in the air, slick and treacherous patches of ice on the streets and walkways, and of course, the snow. Copious pilings of semi-frozen precipitation that barricades doorways, buries driveways, and covers the ground with a thick outer layer of icy pulpous mush. Traditionally, the method used to clear snow was to manually shovel it away. That might be fine for less than 3 inches light and fluffy snow but when it’s a few feet deep and heavy and slushy, shovelling quickly becomes a less viable option. Every Winter, shovelling snow results in many a pulled and strained muscles, sore backs, and stiff knees. To help lessen the physical impact done to one’s own body during snow removal, the snowblower (or snow thrower) was invented. Since 1925, machines replaced muslce and people have made short work of clearing away snow from their properties. Snowblowers, much like the lawnmower and your other lawn and garden power equipment, require regular maintenance and care in order for them to perform at their optimal level. At Discount Starter & Alternator, we sell replacement parts and service pieces for Tecumseh, John Deere, Honda, TORO, MTD, Cub Cadet, and other popular quality snowblower power equipment manufacturers. 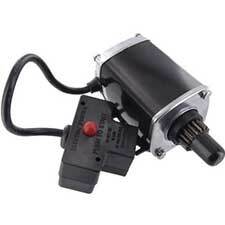 Shop Discount Starter & Alternator and browse our impressive online inventory for electric starter motors and other replacement parts for snowblowers.